This is the third in a series of blogs highlighting the stories behind the stories of “wolf conservation” under Curt Melcher and Governor Brown’s Department of Fish and Wildlife. Last year we kicked things off with the Friday Trash in which we talked about hidden details behind the Harl Butte wolf killing of 2017. Earlier this week, we posted the Everyday Trash in which we gave more context to the state’s latest kill operation. They say sunlight is the best disinfectant. Today we want to take out the rest of the trash and let the sun shine on a few more things ODFW has tried to sweep into a dark corner in their latest effort to pretend all is well when it comes to Oregon’s fragile wolf recovery. If you like bullet points more than bullets, this blog’s for you. When ODFW released their annual wolf report and spoke with reporters, the state did everything they could to focus on a glass-half-full story. Oregon's known wolf population grew by 11%. That's all you really need to know. As usual, most media reported the story in that frame. In the last two years, the population has only grown by 14 known animals. Last year, some at ODFW discounted our concerns about stagnant population growth saying they believed many wolves simply went uncounted due to challenging weather. Had that been true, this year’s count should have captured two years of growth. The population should have grown dramatically. Until wolves were prematurely (and illegally) stripped from state Endangered Species protections in 2015, the population was growing exponentially at rates around 30%. Had that growth rate continued after delisting, the population would be above 200! There has been zero increase in the number of breeding pairs and packs in the last two years. That's really stunning. That’s a number ODFW used to say was more important than the population estimate. It's also the measure by which - until now - the agency actually measured recovery. There remains only one breeding pair of wolves in Western Oregon. The number of packs decreased*. 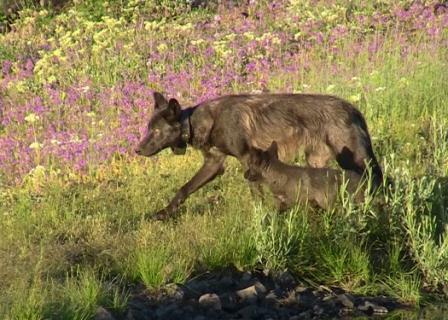 ​The state made bold claims of wolves expanding into Western Oregon. They pointed to the southern slopes of Mt. Hood where a pair of wolves was seen last year. They hope that distracted you from looking at the rest of the map. The good news of two “new” wolves was more than offset by the reality of poaching and disappearing packs elsewhere. Only one of thirteen known wolf mortalities (8%) was attributed to natural causes. ODFW shared more comprehensive statistics on known wolf mortality numbers this year. That was appreciated, but sobering. There are undoubtedly wolf deaths we don't know about, but of the ones we do, 12 were killed by people (5 by ODFW, 4 by poaching, 2 under controversial circumstances, and 1 was “accidentally taken” by a cyanide bomb set out by Wildlife Services). Only one died of natural causes (unknown disease). Since wolves began returning to Oregon, the agency has confirmed the cause of 37 known wolf deaths, 34 (92%) were human caused. Only 3 have died of natural causes (two were pups). Oregon is home to over 1.3 million cows. Over 55,000 die before being shipped to the slaughterhouse from things like weather, disease, domestic dogs, and accidents. Last year, wolves were responsible for a total loss of 11 calves, 1 llama, 1 alpaca, and 23 domestic fowl in a single incident. One incident was retroactively confirmed. In response, Director Melcher approved kill orders for 10 of the state's (then) 112 known wolves. Full market compensation was available. The state paid out $15,227 for those losses and more than twice that amount ($34,942) for questionable claims of “missing livestock”. Conflict with livestock decreased in 2017. That’s great. But the state responded by killing even more wolves. The result? So far in 2018, the rate of livestock predation by wolves has more than tripled and Governor Brown’s agency has issued kill orders for 5 more wolves. That’s exactly what scientists told ODFW to expect. Reducing protections and killing wolves to appease wolf haters means more dead livestock, more dead wolves, and more angry people. Killing simply begets more killing. From 2013 to 2015, Oregon tried something different. Under rules agreed to by conservationists, the livestock industry and the state, there were meaningful requirements that non-lethal conflict prevention measures be in place before killing wolves could be considered. During that time the agency never had to kill wolves. Conflict with livestock decreased (23%) even as the wolf population grew (72%). Since wolves were delisted and those rules expired, agency wolf killing has increased every year. The wolf population has barely grown (12%) and conflict with livestock has increased (88%). Governor Brown also got in on the action, sharing a statement in which she tried to celebrate wolf recovery while appeasing anti-wolf interests who actively oppose her governorship and her agenda. She equated wolf poaching with livestock conflict in a statement that landed about as flat as the one she put out after signing legislation to insulate ODFW's decision to delist wolves from judicial review. Put another way, as a proportion of their respective population, our wildlife agency is killing wolves at a rate eleven-thousand-four-hundred times more than wolves are eating cows. Is that "balanced management"? For those of you who haven’t seen enough bullet points and statistics yet, let’s go a little deeper into those livestock conflicts. A few years ago we provided some context showing the many ways livestock are lost (car accidents, thieves, domestic dogs, old hay, algae poisoning, etc.). We have lots of new examples. For instance in a recent magazine piece glamorizing the livestock industry, Cattlemen’s Association Wolf Committee Chair Todd Nash acknowledged losing more cows to a single lightning strike than were lost to wolves in the entire state all of last year. Facing a budget crisis, Director Melcher’s staff regularly acknowledges that they “drop everything” to address the concerns of livestock producers. Most of their wolf program resources go to that effort. While the state can find tens of thousands of dollars for helicopter kill operations, to fund federal trappers, and pay for livestock that simply go missing, ODFW has proven itself utterly incapable of carrying out its conservation mission. 42 (64%) were definitively attributed to other causes. 7 (10%) were due to unknown causes. 17 (26%) were confirmed due to wolves. Broken down another way, in the 59 cases where livestock managers were most convinced their animal had been killed by wolves and the agency was able to make a definitive call, 71% were definitively not killed by wolves. 81% of investigations and confirmed incidents were on private land. That makes it even more remarkable that only 27 incidents were discovered within three days of occurring. Nearly 20% of the dead or injured animals weren’t even discovered within a week. In some cases it was over a month. Given that the most effective – and widely claimed - deterrent to conflict between livestock and wildlife is human presence, that’s clearly a problem. We hope this will be the last “Trash” piece we have to serve up. We sure hope we're wrong about all this. But that's what we hoped last year. Rather than an aberation, we're seeing the begninning of a trend. Given the trajectory ODFW has been on for the last few years, we’re not optimistic that the agency is all that concerned. We've thrown a lot of numbers at you here. When it comes to honoring their conservation mission, being transparent, and being accountable to the broad public they serve, Governor Brown and Curt Melcher have 99 problems. That’s just one. If you want to help change that, we suggest you give Governor Brown’s office a call. Politely let them know how you feel about what’s going on with her wildlife agency: (503) 378-4582. *Due to feedback, we have made several minor changes to this piece. It's important to us that we be accurate. If you find inaccuracies here, please feel free to let us know. Specifically, we changed the description of the graph showing wolf predation and agency wolf kills. Those numbers are a projection based on 2018 numbers at the time of writing. We also want to clarify that in our description of the situation in Western Oregon, we used the word "packs" colloquially as a group of known wolves. ODFW defines the term as "four or more wolves travelling together during winter".